Do environmental compliance problems happen overnight? Perhaps, but problems with environmental compliance are more often the result of incremental changes that accumulate over time. 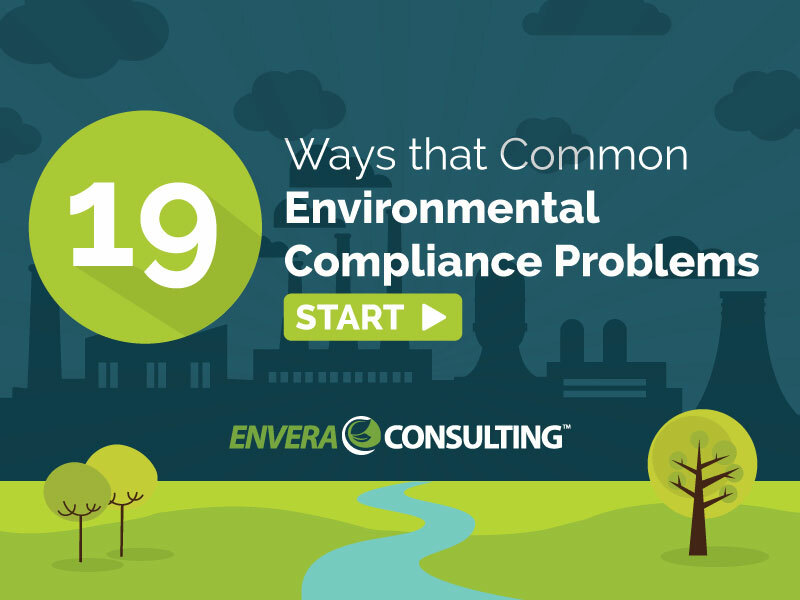 If there’s one thing we at Envera have learned from working to untangle environmental compliance problems, it’s that these problems tend to grow in size and complexity the longer they’re ignored. Sometimes a problem can be as simple as submitting a report one day late; in others, it can be a series of many small problems that accumulate over time. In more complicated cases, environmental compliance problems can go undetected for years, only to finally be discovered during an audit or inspection. In any case, we’d like to share what we know about how environmental compliance problems start and we’ve assembled this list from years of working with regulated entities and solving their environmental compliance problems. If you understand how the following 19 common problems can occur, you’ll be better prepared to avoid them. Typically, the folks in the environmental department spend their days negotiating with the agency and trying to figure out what needs to be done to comply with the ginormous amount of environmental regulations. Since the day-to-day work of implementing the compliance decisions is left to other departments like maintenance and operations, there needs to be clear instructions on how this work is to be completed. In fact, it’s quite common that what people say they do in the field is very different than what is expected or needs to be done. Solution: To eliminate this problem, it’s best to communicate the requirements to the respective departments and then follow the advice of an old Russian proverb: “trust, but verify.” That means that, after discussing the outcome you expect, you give the field teams the leeway to proceed as they see fit, then double-check the work when it’s completed — just to be sure. As a regulated entity, you’re required by federal, state, and local law to follow all of the rule requirements of the various regulatory agencies. And to best follow the rules in their entirety, you should fully understand each and every one, as well as retain documentation that demonstrates how you’re meeting the requirements. If you encounter a situation where you cannot meet a rule requirement, you may need to file for a variance or get relief from a potential enforcement action. Solution: Appoint someone — either a member of your full-time staff or a consultant — to stay on top of the agency rules. Environmental rules change more frequently than some folks realize. Such changes may render a previously allowed work practice verboten — which is a frequent way for a compliance problem to arise. So it’s important to know when rules that apply to your facility are amended so that you don’t experience hiccups — or worse — maintaining compliance. Solution: Have a point person — who could be the same person as in the point above — in charge of staying on top of rule amendments. You can also get involved in the rule-making process, which is open to the public, to stay aware of how a proposed rule might impact your facility. Refer to the South Coast Air Quality Management District (SCAQMD) website for a list of current proposed rules. Environmental compliance programs are large and multifaceted, with many moving parts and potential weak links. Conducting internal audits is one of the most efficient ways to identify such problems within your environmental program. Solution: Develop a procedure and regular schedule for internal auditing. It’s hard to comply with a rule if a piece of equipment always breaks down, causing you to deviate from a rule’s requirements. Solution: Perform maintenance on all of your equipment — especially permitted equipment — at frequencies recommended by the manufacturer. Be sure to keep records of the maintenance and the original manufacturer’s manual to show that you’re maintaining the equipment according to the specifications of the manufacturer. Environmental compliance reports involve what we call “the compliance trifecta” of monitoring, reporting, and recordkeeping. Required compliance reports, no matter how small or insignificant they may seem, must be submitted if required, and they must be submitted on time. With all the responsibilities required to keep your business running, it can be easy to lose track of the due dates for compliance reports. Solution: The point person mentioned in bullets 2 and 3 above can also be in charge of creating a calendar of when all reports are due. Luckily, the SCAQMD is pretty consistent, so the dates don’t often change from year to year. When the staff members in your department move, get promoted, or leave the company, you run the risk of noncompliance due to the loss of institutional knowledge. This can lead to permits not getting renewed, compliance reports not being submitted, or even known compliance problems not being addressed. Whatever the case, plan for attrition within your department. Solution: When a staff member vacates a post, be sure to have a general idea of what’s needed to keep the department moving forward, particularly in the next 60 days. If there’s a lot of interaction between your facility and the regulatory agency, let them know your facility is going through a transition. Regulations are black and white. They tell you what you can and can’t do in order to maintain compliance. However, environmental regulations can become tricky when they’re put into practice, which is when a lot of gray areas tend to arise. These gray areas often stem from poorly worded permit conditions that are difficult — or even impossible — to comply with. Solution: Review all of your permit conditions through the lens of an inspector. If the condition isn’t clear or needs interpretation, it probably needs to be revised. Although this is similar to the above point, it’s different enough that it warrants its own bullet. We’ve encountered inappropriate permit conditions more times than we can count. Such conditions are problematic because, as a permit holder, you’re almost always required to follow the conditions on the face of your permit — even if they’re impossible to comply with. Two examples include requiring compliance plans for regulations that don’t apply to the facility and requiring source testing more frequently than what’s required for a specific regulation. Solution: Review the draft permit as soon as you receive it from the agency, prior to the issuance of the official permit. In certain cases, a regulatory agency will allow a facility to comment and make changes to a permit within a certain time period. The operation of a process or piece of equipment often requires a permit from a regulatory agency prior to commencement of the process or even before the equipment is delivered to the facility. Solution: Review all of the permitting requirements prior to purchasing any piece of equipment, constructing a piece of equipment, or modifying an existing process. It’s important to know that the community around your operation can submit complaints to your regulatory agency if they feel you’re not operating in compliance. These complaints often start as nuisance issues such as odors, visible emissions, etc. Solution: Be sure you’re operating your facility in a way that doesn’t impact the surrounding community. Be mindful of odors, visible emissions, fenceline emissions, or even the appearance of what may appear to be noncompliance. While it’s okay to disagree with your inspector or the decision of a regulatory agency, it’s best to maintain professionalism and not start arguing with or belittling your inspector. Such antics can easily lead to problems. Solution: Maintain professionalism at all times — even when you most want to blow your top. Trust us. It’ll save you a lot of pain in the long run. It’s possible to inherit compliance problems during a merger or acquisition (M&A), at which time the problems of the old company become the problems of the new company. Operating with an expired permit can be as bad as operating without one at all. Almost all permits have an expiration date, and it’s important to know those dates. Some permits expire annually while others expire after several years. Solution: To minimize the risk for problems, track the expiration dates of all of your permits and keep a timeline of when permit renewal applications need to be submitted. You can keep track of these dates in the same calendar mentioned in bullet #6 above. Sometimes, you just can’t help experiencing a little backlash when an employee leaves on bad terms. It’s not uncommon for a former staff member, particularly one who has been terminated, to try to get back by reporting any environmental violations to a regulatory agency. Solution: Depending on the types of compliance issues you have, ensure that information is shared only with those who need to know it in order to properly do their jobs. And stay in compliance! If you do so, there’s nothing for the former employee to report. As we’ve already mentioned, environmental issues grow in size and complexity the longer they are left unaddressed, and the growth can be exponential. Solution: When problems arise that can negatively affect your environmental compliance, fix them as soon as possible, no matter how small they may seem. A molehill can turn into a mountain more quickly than you think. Staying on top of the small things will not only help you maintain compliance, but it can help if you later have to explain yourself to the regulatory agency if you receive a notice of violation (NOV). An air permit is issued not just for a specific process but a specific way to go about that process. Compliance problems can arise if changes to the process are made without the proper environmental review. For example, changing a process temperature could result in an emissions increase, or re-routing a process line could end up bypassing a vital piece of control equipment. Solution: Get input from your environmental department before buying equipment or beginning construction. While each regulatory agency is different, most have annual fees that must be paid. Examples of these include permit renewals for annual emission reports, hazard waste reports, and permit renewal fees. In certain cases, if a fee is not paid, the facility’s permits could be voided — which could result in an NOV. If a regulatory agency requests data, you should always respond in a timely manner. In certain cases, if the agency doesn’t receive the requested data, an inspector can issue a notice to comply (NTC), and if the information is still not provided, the NTC will turn it into a notice of violation (NOV). Solution: Maintain open communication between your company and the agency, and develop a system so folks know the timeframe to respond to the agency.